If you own a bar or restaurant, you know that these types of businesses require a lot of signage in order to advertise menu items, special events, and promotional materials. An indoor LED sign can be of amazing use in accurately communicating a bar or restaurant’s marketing message. Light, easy to use, fun, and versatile, they can turn any dull space into a point of contact where you have the opportunity to gain a new customer or up-sell an existing one. In the bar and restaurant industries, there’s a lot of room for disappointment. Perhaps what you ordered didn’t taste exactly like you thought it would. Perhaps the customer service was rude. Perhaps the venue itself wasn’t what you expected. Maybe you had to wait to pay or wait to be seated and you didn’t like that. There are multiple points of contact between business and customer where disappointment could occur. There are many benefits to using indoor LED signs in your bar or restaurant business and the primary benefit, no doubt, is the opportunity to make the customer experience a little more fun. There’s no reason not to have a little fun in putting together your video or slideshow picture presentation to be featured in your digital sign. Many bars or restaurants have begun using indoor LED displays to further advertise to their guests involvement on social media sites such as Facebook, Twitter, and Instagram. Don’t be afraid to ask for a “like” or a “share”. The businesses that show that they’re active in social media and who actively engage their customers online show a noticeably higher customer satisfaction rate. The fact that one is able to put together a slideshow of advertisements means that you have unlimited space to advertise as much as you want to advertise. While it is important, to limit how many slides you want to input and when, many bar and/or restaurant owners choose to feature promote specific menu items or specials at different times of day in order to maximize the opportunity for sales. This is a smart way to draw in new fans of your business as well as to keep your message fresh over the course of the day. There are two separate approaches that can be taken with regards to wait times and the clever use of your indoor LED sign. One can choose to feature a wait time as a means to indicate to your customers how long they may be expected to wait or one may choose not to mention it and instead add in various content to get the customer’s mind off of the wait such as the weather, stock tickers, sports scores, etc. Every customer likes a deal. If there’s a specific special you would like featured, promote it here with your indoor LED sign instead of having to put up paper posters everywhere. This is a major opportunity to use photos and videos as a means to entice the customer into purchasing the designated option. One can cleverly craft a visual commercial for any menu item – an approach that proves to be very effective in being able to direct sales. Business owners that are willing to invest in their bar or restaurant with an indoor LED sign can expect to see an increase in sales. While effective use is most important, just the mere presence of an indoor LED screen will show the customer that your bar or restaurant is savvy enough to be willing to use digital technologies as a means to advance the brand. Digital technologies are attractive to the modern audience and will serve to help your customers feel as if they’ve made the right choice coming to your establishment. 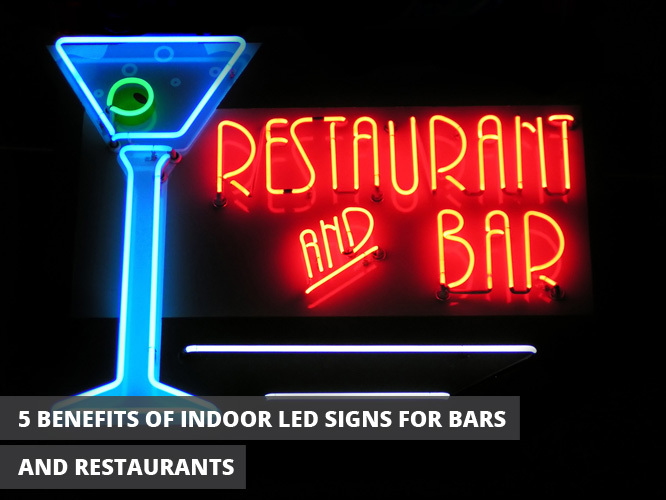 These are five benefits of using an indoor LED sign at your bar or restaurant. These are just a few of the reasons why one might consider investing in these technologies in order to keep up with the competition and ensure that your audience continues to grow in the weeks, months, and years to come.